Geocaching HQ staff will attend dozens of Mega and Giga-Events around the world, shaking hands, sharing stories of adventure, and of course, geocaching. Heather M (Heather Feather) is the Community Volunteer Special Programs Manager for Mega and Giga-Events at Geocaching HQ. She recently traveled to the Netherlands to attend the Hoorn Mega-Event. Here’s her trip recap. When planning for any trip, one of the first things I do is check out the weather report. (Heather Feather checks the weather!). For my visit to the Netherlands for the Hoorn Mega, the report was a little concerning: chilly, rainy, with winds up to 64km/h (40mph). It was March in North Holland after all, but those were still dodgy conditions. Luckily, the event details indicated an indoor homebase, but geocachers rarely hide from the elements. With all my favorite weatherproof staples and plenty of lackey tags packed, I prepared for a rugged weekend. Once my plane landed, the first item on my agenda was to meet up with the event host crew. As manager of Mega-Events at HQ, this is something I look forward to the most: meeting the faces behind the emails. After years of communicating with this crew, I was excited to finally meet them in real life. As I entered our meeting spot, my eyes caught a big table of smiling faces and bright red shirts. I knew I was in the right place! 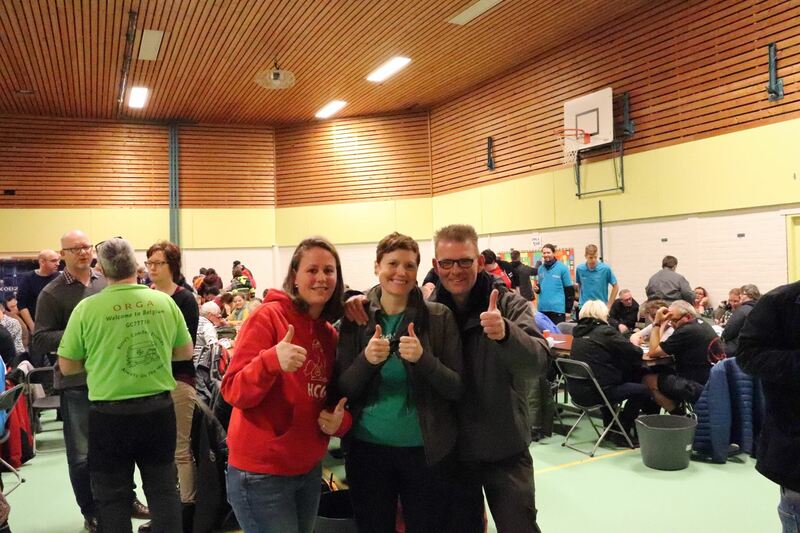 The Hoorn Cache Event is led by four core teams: Mar.Co, H.P.M, Team JoWi, and de Goesjes. Their efforts are supported abundantly by dedicated friends and volunteers. As we sat together that evening, I was eager to hear more history about the event, the location, and the team members. They had worked on events together for several years, and this was their 8th and final swan song. With the bittersweet theme of “Game Over,” this final event weekend was to throw one last celebration of their community, to honor their love for geocaching and their years together. I was treated to a behind-the-scenes tour before the kick-off event started. With just an hour before people were to arrive, the team appeared calm and in great spirits. It was clear that their years of experience helped them hone in on many ways to make the event better and more enjoyable for their guests (and themselves!). For example, they designed their lab cache activities in clever ways that allowed large groups to participate at once and interact with each other. No small feat! Also, the layout of the space and specially designated areas was thoughtful and flowed effectively (as shown later when filled with people). It’s often these small things that can make all the difference when hosting hundreds of people at once in a limited space, and I was impressed by their planning, and trusted that the weather forecast wouldn’t make a big impact on the outcome of this event. During the kick-off event and the “big day” I met so many lovely new people, and caught up with some familiar faces as well. During my conversations, one frequent thing that stuck out to me was that there were so many truly connected cachers. It’s not uncommon for me to hear of the “geocaching widow” scenario – when one partner isn’t as into caching as the other person. With many of the folks I spoke with, it was actually the opposite. One couple said that they often cache together, but sometimes the ladies go off and do their own caching trip, and the men do as well. A family of four shared how they go caching with their twin teenage sons (one loves climbing caches and the other…does not). I loved hearing them share how they all found their own balance, showing that there are many ways to make geocaching your own. These are just a few examples of how people mentioned to me how they have been able to create meaningful connections with each other in unique and personalized ways. Be still my heart! When out caching, I met up with a crew of geobicyclists. I’d been stumped at a gadget cache earlier, and they kindly offered to assist. Back at the cache, they retold great stories of their group’s caching adventures over the years. Their fun stories remind me of the countless ways people are positively impacted by geocaching as a community through fun, zany excursions. That might seem obvious, but at HQ we often miss out hearing about the good times like these. It’s our job to help geocachers, so we often hear about issues and problems that need solving. When all is going well, people are out geocaching instead of telling us about how much fun they are having – and that’s the way it should be! Yet, sometimes I forget how geocaching really impacts people. At the Hoorn Mega, I met people who were eager to share stories of their amazing moments. It reminded me that the game is bigger than guidelines and the technical glitches I usually respond to in emails. It reminded me that geocaching is really about meaningful relationships, shared experiences, and supportive communities. 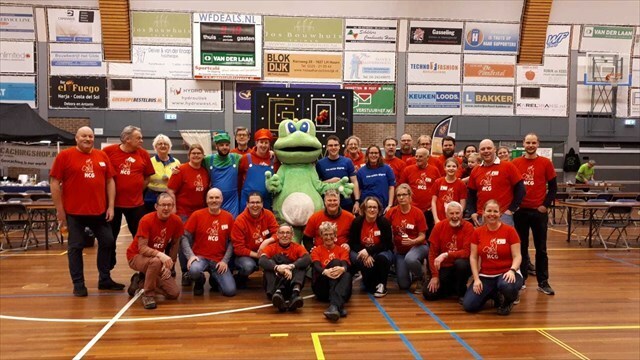 I’ll fondly remember this last Hoorn Mega as a representative of the close-knit communities that can develop through this unique game/hobby/lifestyle. Finally, a big thank you to each of the event hosts for welcoming me into their fold for the weekend. I felt like family, which is more than I ever could have expected. See you on the trails!